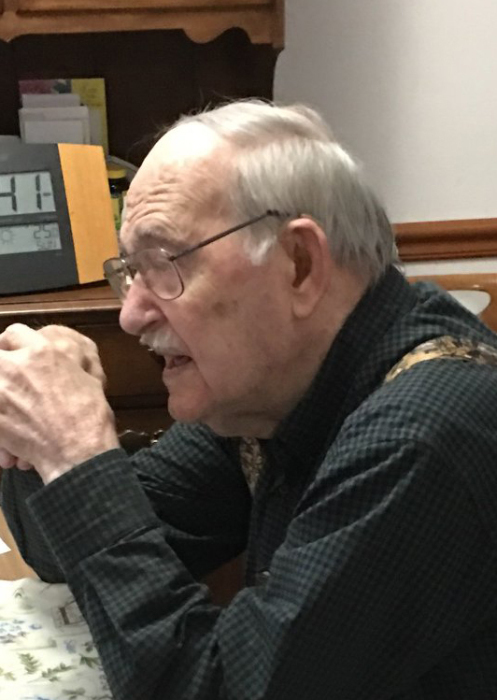 Richard Howard Terrill, better known as “Howdy”, passed away on March 18, 2019 at his home in Bland at 87 years of age. He was born on August 20, 1931 to the late Richard L. and Edna (Lacy) Terrill. On December 16, 1950 Howdy was married to Shirley Blackwell. From this union was born four children. One daughter, Frances and three sons, Carlos, John and Tim. He is survived by his wife and children plus seven grandchildren, one step-grandchild, and six great-grandchildren. After high school, Howdy and his good friend, Don Johnson, worked in the restaurant business for a year. It was during this time, he felt God calling him to the ministry. With a wife and 2 small children, Howdy entered Southwest Baptist College in Bolivar, where he and his wife graduated from the two year college. He then went on to attend S.W.M.S in Springfield, graduating with honors and a BA degree in sociology and history. During the four years in college at S.M.S, Richard pastored the Beulah Baptist Church and the Liberty Baptist Church. His next church was the High Gate Baptist Church where he and his family stayed until 1977, a period of 16 or 17 years. Because of his failing health he did not pastor another church but stayed active performing marriages and officiating funerals. The next few years were spent in various activities. One of them working with his dad on the farm and raising cattle on his own farm. Howdy was an avid sportsman, loving hunting of all kinds. He raised hunting dogs, and had hunted fox and coyotes since he was a teenager. He was a self-taught gunsmith and collector. In his younger days, basketball, softball, and baseball kept him busy. Richard was preceded in death by, his parents, two sisters and their husbands AnnaBelle and Jay Scheel and Wilma June and Donald Dinkela. Howdy is survived by his wife, Shirley; his children and spouses, Frances Hamner and her husband Robert, Carlos Terrill and his wife Peggy, John Terrill, Tim Terrill and his wife Pam; grandchildren, Robert Hamner Jr. and his wife Alicia, Thomas Hamner, Carla Price and her husband Jesse, Travis Terrill and his wife Nichole, Matthew Terrill, Nick Terrill and his wife Susan, Rachel Drewel, Heather Kottwitz and her husband Jesse; great-grandchildren, Lance Price, Gage Terrill, Brody Terrill, Luke Terrill, Ryker Kottwitz, and Ridge Kottwitz. Visitation for Richard will be held from 5:00 p.m. until 8:00 p.m. on Friday, March 22, 2019 at Sassmann’s Chapel in Bland. Funeral services will be at 11:00 a.m. on Saturday, March 23, 2019 at the First Baptist Church in Bland. Interment be in the Bland Union Cemetery.